What is performance? How do we perform? Why do we perform? 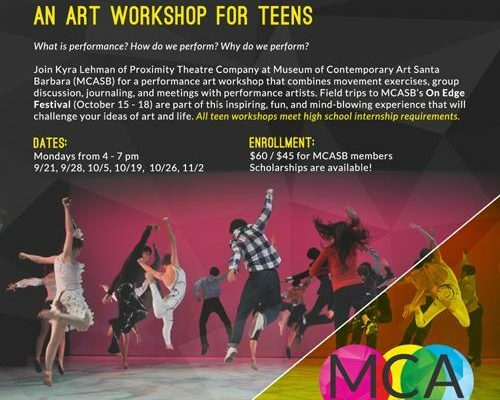 Join Kyra Lehman of Proximity Theatre Company at Museum of Contemporary Art Santa Barbara (MCASB) for a six-week performance art workshop that combines movement exercises, group discussion, journaling, and meetings with working performance artists. Field trips to the museum’s On Edge Festival (October 15 – 18, 2015) are part of this inspiring, fun, and mind-blowing experience that will challenge your ideas of art and life. All teen workshops meet high school internship requirements. To enroll, email education@mcasantabarbara.org or call 805.966.5373 x103.